I played in a number of U.S. Opens when I was on the LPGA Tour, but I never thought I would be caddying in the men's U.S. Open. To be at the Open with your student whom you’ve been with for nine years, watching him reach his goals, to be a part of his dreams, to realize that he is the real thing, this is true satisfaction. I had caddied for Michael Thomson in his first U.S. Amateur at Winged Foot in 2004, so it was a real privilege to caddy for him again in his first US Open. The first two days, Michael had a fabulous pairing, playing with Rocco Mediate. Rocco is as nice as can be and funny. And he never stopped talking. He was definitely on his game that week, losing to Tiger Woods eventually on the first sudden death hole aft er an 18-hole playoff round. The Open is all about placing your ball in the right spot so you have a chance at the next shot. Playing with Rocco, Michael was getting a first-hand lesson. To be sure, Michael was ready for the task and was really enjoying this opportunity to play with the best players in the world. The first round was pretty solid even though he had his highest score. Michael hit 14 greens and shot 75. We worked very closely through each round. As the tournament went on my player instincts really kicked in. Michael wanted to verbalize each shot, to visualize it and to make a commitment to the shot he intended. He would tell me what he saw, where his target would be, where he saw the putt breaking or where the ball should enter the hole. Michael and I have worked many years on realizing you cannot control your ball but you can control your preparation and your reaction to the shot. Michael let each shot “go” and did not control it. However, he was very much in control of his emotions and his composure. He is very mature and in this game that really pays off . The second day was an amazing display of tenacity and patience. Michael was three over for the first three holes then played one under from there. He didn’t have a good feel for where the club was that day so the ball was all over the course. But he kept it together and endured, making putts and chipping it close. He birdied the 9th and 10th holes, and a birdie on 18 assured him of making the cut. We were ecstatic; his first cut in a major. The third round started off just as shaky but he managed to keep it together and shot another 73. Michael stays in the shot so well—no past, no future, just the moment. Each day I heard a lot of “Go Mom!” gallery chatter. Who knew that I was Michael’s instructor? Tell me, what kid would have his mom caddy for him in the Open? I wanted to wear a sign that said, “I’m not the Mom!” But Michael is very secure in himself and loved having me along for the ride, even though I was the only female instructor in the field. The fourth round seemed a lot calmer than the first three. Michael’s ball went where he was looking more often. As my player skills were being piqued we were making some great decisions together. Michael shot a cool 72 and finished as the low amateur, tied for 29th in the field. I was so proud of him as a golfer but more so as a person. He stood up under the heat and flourished. I only see great things happening for Michael. And me? Well, I got to go home to my husband and two kids and do what I love to do: help people with their golf games. As we know there is so much more to golf than the swing. Guiding golfers through the maze of details that this game entails and making it more enjoyable and “do-able” is what I’m all about. And Michael? Well, he turns professional the first of July and will try to get some sponsor exemptions into PGA events and then go to Qualifying School for the PGA Tour in the fall. He is a very happy and confident young man and will make his way in the world of professional golf just fine! 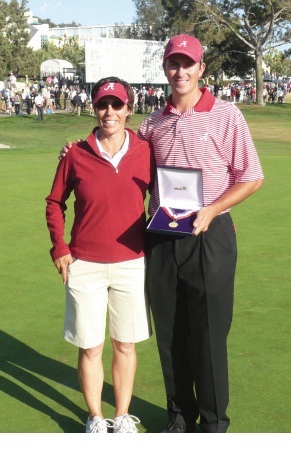 Susie Meyers, longtime teaching professional at Ventana, has been coaching Michael Thompson, one of the nation’s top amateur golfers, for the past nine years. She caddied for him in the recent U.S. Open at Torrey Pines in California. “Just having fun,” was the theme of Tucsonan Michael Thompson and Rocco Mediate, although the stakes were quite a bit more serious for Mediate Sunday at the U.S. Open. Thompson was serious enough, though, to claim low amateur honors and a tie for 29th place at Torrey Pines, Calif. The University High School graduate posted five birdies and a 1-over-par 72 on Sunday. Thompson made a 22-foot putt for a birdie on the 11th hole – which got national TV-replay – to key his effort Sunday on the difficult South course during an up-and-down final day. Thompson played with Mediate, who will compete in an 18-hole playoff Monday against Tiger Woods for the U.S. Open title. Thompson will play in the Traveler’s Championship in Connecticut next week and the Palmer Cup in Scotland as an amateur before turning pro on the Nationwide Tour on July 24. “I’m hoping for a few exemptions in PGA events before Q (qualifying) school in September,” he said. He’s far from being a veteran pro, but had one advantage at the big tourney. “I never gave up this week,” he said. And thus at 7:32 Thursday morning, a few seconds before Michael Thompson was to stick a tee into the ground and either faint or skull one into the ocean - OK, not really, he is in the U.S. Open, after all - he did the last thing you would expect. He laughed when 53-year-old Brad Bryant, a sad-eyed, Champions Tour campaigner who wears rumpled clothes and has forever been known as "Dr. Dirt,'' broke the tension by saying something funny at the exact moment you didn't think there was anything funny in the world. Thus de-iced, the 23-year-old University High School grad shot a skilled 74 and emerged from the scorer's shack to say, "I'm still in the U.S. Open.'' He didn't embarrass himself; he distinguished himself at Torrey Pines. You can only imagine how difficult it is for someone two weeks removed from receiving his accounting degree from the University of Alabama, or anywhere, to shoot a 74 in the first round of the Open. And isn't that the most sensible context? Young Mr. Thompson is a wee lad in the golfing business; he isn't going to turn pro until the Nationwide Tour's July 24 event in Columbus, Ohio, and he hasn't even cleaned out his apartment in Tuscaloosa, Ala., and moved back into the real world. He shot a 74 in the Open anyway. He shot a 74 on a day that 11 guys shot 80 (or worse) before lunch. Part of it was that Thompson played in the Masters two months ago and emerged from the pressure of Augusta, Ga., educated in the feel of a Really Big Event. Another part was that Bryant and Rocco Mediate, who probably leads the PGA Tour in light chatter, turned the day into a gabfest. What, me worry? Mediate shot a 69 and was near the lead all day. Thompson took the cue. A few minutes later, Brad Bryant excused himself, walked a few dozen yards into the weeds and, ahem, took care of nature's business. Thompson must have wondered if he wrongly took a detour to the Quad Cities Open. Thompson was hitting fairways (15) and greens (14) all day; he failed to dissolve when five of his putts either stopped on the lip or skimmed the edge of the cup. You don't need much imagination to picture his 74 being a 70 or better. Meyers, a former Arizona Wildcat golfer who played on the LPGA Tour, was Thompson's caddie/teacher during his remarkable run to the finals of the U.S. Amateur 10 months ago. Their partnership flows. Thompson completed his college odyssey at Alabama last month. He won eight tournaments at Tulane and Alabama and was a consensus All-American whose most recent honor was being named to the All-Jack Nicklaus team. That earned him an exemption into the Children's Hospital Invitational on July 24-27 in Columbus, Ohio, which is scheduled to be his pro debut. Before that, he has accepted an exemption, as an amateur, to play in next week's PGA Tour event, the Traveler's Championship, in Connecticut. Thereafter, he will fly to Scotland to play for Team USA in the June 26-27 Palmer Cup. His mother, Beth, a teacher at Sabino High School, is acting as his agent until he turns pro. He also is beginning the process of selecting endorsement offers from equipment and clothing manufacturers. But those are stories for another day. Today, at the U.S. Open, it is a good time to be Michael Thompson. If the link doesn't work, go to azstarnet, search for "Tucsonan relaxed, solid on first day" and select "search archives"